Thank you to our wind turbine crew! The wind turbine was lowered today in advance of Hurricane Maria. It’s the first time it has been lowered for a storm in the 5+ years of operation. We had phone call assistance from Jeff Cabrera, a key from Roy Fern and muscle from Stan Joines, Jeffrey Turk, and Don Bailey. We appreciate your prayers for safety but don’t pray for the hurricane to shift somewhere else. That would just send it to St Thomas which already has enough trouble. Comments Off on Thank you to our wind turbine crew! Renewable-energy advocates often say we must use the gift of natural resources – wind and sun. St. Croix Reformed Church took the gift idea to the ultimate, using the wind to give a gift to local students. When in 2012 the church installed a wind turbine with funding from the V.I. Energy Office, it made a commitment to use the savings for the island’s benefit. After a year of operation and accumulation of savings, the church reached out this fall to the nearby Alfredo Andrews Elementary School to determine its needs and how the church could assist. 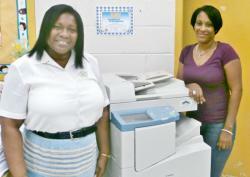 Principal Joan A. Claxton responded that the school copy machine had recently failed and a replacement was needed. The church purchased, with savings from its Water and Power bill, a used machine and had it serviced by Adan Business Machines, then delivered it to the school. The church’s 10-kilowatt turbine is hooked into WAPA through the net metering program designed by the Energy Office. So far, the Reformed Church is the only institution that has turned its savings into a method of giving directly back to the community. Several organizations that net meter have expressed an interest in giving the excess energy they produce to non-profits. However the logistics and the economics do not appear to work for the power company. Energy Office spokesperson Don Buchanan said the American Recovery and Reinvestment grant for the turbine was $50,000 and the church contributed $16,500 to the project. He said the turbine will pay for itself in eight years. “We will, from time to time, be making additional donations,” Koopmans said. Students from the St Croix Math and Environmental Science Academy visited our church last week to learn about Wind energy and turbine technology. 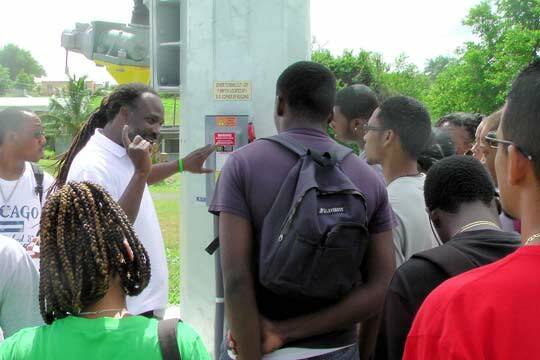 Led by Carl Joseph from the VI Energy Office (pictured below), the students learned the science of how turbines capture and convert wind to electrical energy to power the St Croix grid. As recently announced in worship, our church will hold the “Turbine Turn It On” Party on Wednesday, February 29th at 5 p.m.
All members and friends of the church and Kingshill School are encouraged to attend. Bring your neighbors! The slideshow below will continue to be UPDATED throughout construction. Rollover the slideshow and click the center stop button, then click the arrows to control advance. 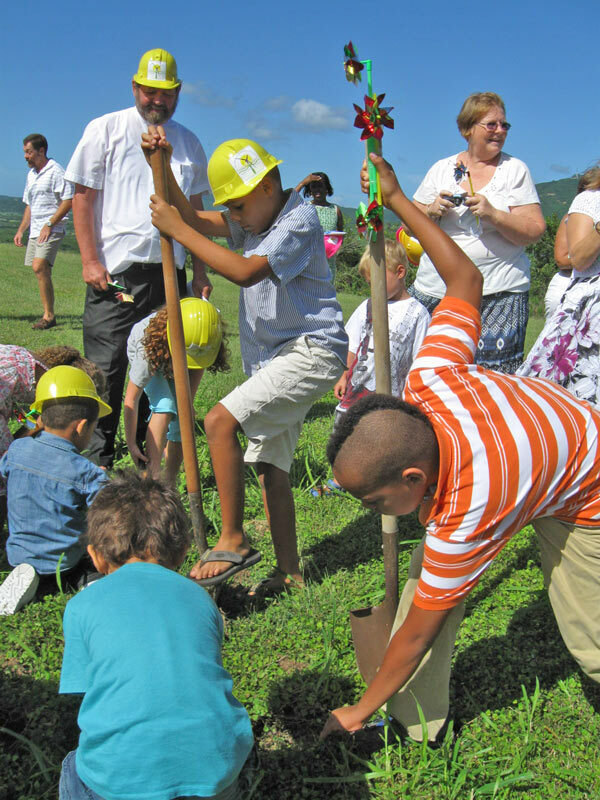 Reverend Rod led the congregation out to the hill for the Wind Turbine groundbreaking ceremony. 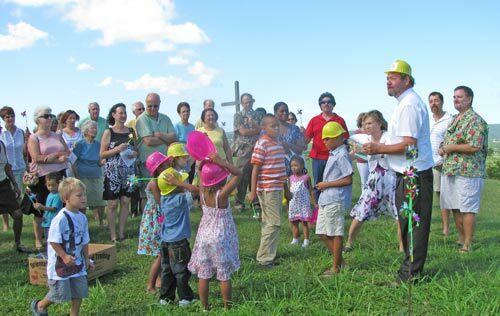 The kids met the congregation, handing out pinwheels and hard hats. 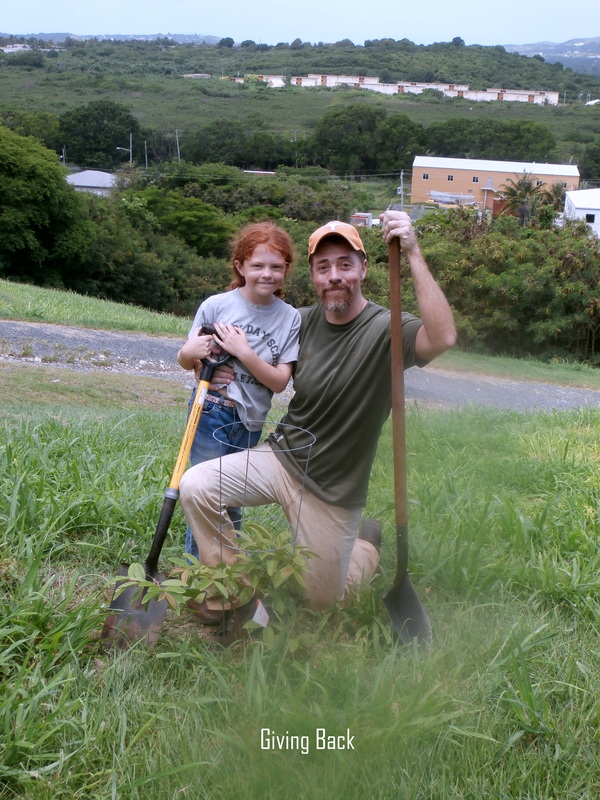 After introducing the Wind Task Force, and further remarks, Rod and the kids put the spade to the hill, …and activity which some children continued for nearly 20 minutes! Numerous adults stepped forward to dig, and following a closing hymn, the congregation enjoyed another sumptious post-worship buffet. The St Croix Reformed Church will hold a brief GROUNDBREAKING CEREMONY for our 10 kw Wind Turbine this Sunday November 13th. Nov 14-24: Digging and pouring of the tower slab. Late November: Digging and installation of electrical cables. Installation of electrical converters. Mid December: Bolting of the tower to the slab. Assembly of the turbine to the tower. “Turning it on” Party ….t.b.a. Here’s a video of a 10 kilowatt wind turbine in action on St Croix’s south shore. Our turbine is 10kw as well and will look like this one. The hyrdaulically operated tower can be lowered for storms and maintenance. The grant was applied for September 8, 2010 and awarded December 21, 2010. Filing of grant acceptance paperwork. Throw the switch and a party! The funds for this project were made available in part by a grant administered by the Virgin Islands Energy Office from funds provided by the U.S. Energy Department, Grant Award Number DE-EE0000223, The American Recovery and Reinvestment Act of 2009. SCRC Awarded Wind Turbine Grant! Reverend Rod received official word Monday December 27th that our church has been awarded a $50,000 grant from the Virgin Islands Energy Office to install a 10 Kilowatt Wind Turbine ! The Church Consistory, having unaimously approved the proposal earlier in the fall, has reviewed the details and filed the final papers to accept the funds and begin the installation process. In January 2011 the permitting and engineering process begins, followed by placing the order for the turbine & tower. Once ordered, it will take approximately 90 days for the pad to be constructed and the equipment to arrive. If all goes well, we could be flipping the switch sometime in May. The church’s out of pocket contribution is approximately $16,500. This money will be borrowed from the church’s reserve funds and paid back by electricity savings per a 7 year schedule. The turbine’s output will be “net-metered” into the island’s power grid. Every kilowatt the turbine produces will be credited on our WAPA bill. The grant money was made available through the US Dept of Energy as part of the Economic Stimulus Plan. Because the cost of electricity in the USVI is the highest in the US, the turbine is projected to save the church upwards of $700 a month on its electricity bill. (1) To provide energy related benevolence to the St Croix community and energy improvements to the church building. (2) To provide additional instructional help to The Kingshill School. (3) To provide maintaince and eventual replacement funds for the turbine. The innovative way in which the church proposed to distribute the savings was part of what caught the grant committee’s eye. In addition to generating savings, it is the church’s hope that the prominent location of the turbine will stimulate discussion and demonstrate the feasibility of wind power on the islands, as well as, make people aware that there is a warm and welcoming Reformed congregation up in La Reine! Our thanks to the members of the Grant Proposal Task Force! Don Bailey, Will Borden, Michael Mongeau, Stan Joines, George Novey, Neil MacQueen, Rod & Janie Koopmans, with technical advice provided by Don Buchanan. The Consistory has authorized Rod Koopmans and Neil MacQueen to form a new “Wind Committee” to oversee installation and operation. Arguably, this is the most appropriately titled church committee ever. If you are interested in being part of that team, let them know. 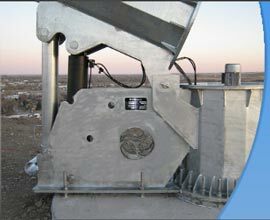 As we move forward, the comittee will be posting progress reports and sharing more details about the turbine and tower. Michael Mongeau, grant compliance, education/promotion, Kingshill School rep. Comments Off on SCRC Awarded Wind Turbine Grant!